"Praying together, Learning for life, Caring for all"
With great fun, patience and skill, Year 5 thoroughly enjoyed their fairground topic. The children have been very creative in using all their Science and design skills to create a fairground ride that actually works. It was great that they were able to show their final products to their new buddies too! Be prepared to be impressed as you watch the pupils at work. Year 5 loved their Lego modelling workshop. They worked collaboratively in pairs to solve the challenges to create the models correctly. Great computing Year 5! Year 5 have sketched characters from The Highwayman poem and used them to inspire their creative writing. This term the Y5 pupils have been studying the classic poem by Alfred Noyes - The Highwayman. We have enjoyed discovering and interpreting the poem through drama, art, dance and creative writing. We will be designing and making scenery and puppets that will lead to a final performance. The children have explored the figurative language of the poem including simile, metaphor, personification and onomatopoeia, which has enhanced their Literacy skills. We are having a great time discovering all about The Normans and the castles they built. We will be having lots of fun building castles, investigating with catapults and levers and competing to design the best and most attractive catapult in our crazy catapult challenge. We will also be visiting Beeston Castle for a fabulous day of fun and learning. Hold tight! Thank you for all your hard work this year! We have had a very colourful time making carnival masks as part of our topic on Rainforests. We looked at a range of ideas and then designed our own. We think they look fabulous! We had a fabulous time at Robinwood!!!!!!!!!!!!! The activities were both challenging and fun. We learned a lot about ourselves and each other and how to work as a team. All the children participated and overcame their fears. Even the teachers showed courage and skill, particularly Mrs Ardern and Mrs Jones, flying through the air with poise and dignity on the swing and Mrs Scott showing prowess in the archery!!!! Happy memories!! The children produced a puppet show based on The Highwayman. They planned out which verses to learn and then created scenery, sound and puppets. Each group performed their show for the class and we also videoed each performance. We had an amazing toy sale!!!!!!! Thank you so much to everyone who donated so generously. The children were spoilt for choice!!!! As part of science week we investigated salt crystals and their effect on paint. We used watery paint with both fine and coarse salt, then we tried thick paint with the same salt crystals. Our results were very interesting and messy!!!!! This half term our topic has been based on the poem 'The Highwayman' by Alfred Noyes. We have explored the poem through drama, art and music and had a workshop where visiting drama teachers and a professional artist helped us to develop 'soundscapes' and 'rhythmic' pictures to further our understanding of the poem. It was a fun and busy day!!!! Congratulations to the children who took part in the Heaton Mersey Festival in class 5SA. We are so proud of you! Year 5 have thoroughly enjoyed their fairground topic. The children have been very creative in using all their Science and design skills to create a fairground ride that actually works. Be prepared to be impressed as you watch the pupils of Y5LJ at work. Our topic in design technology this half term is all about fairgrounds. We made a circuit using a buzzer and then designed a shaky hand tester. We are going to use these skills to make a fairground ride and add in a motor and lights. Welcome to the start of 2015 and in Year 5 SA we had a lovely collective act of worship led by Amber, Holly, Sean and Joe Kelly. We thought about how we wanted to start our new year and made some promises that we will try and keep!! We had a busy afternoon at Loreto investigating materials. The children really enjoyed working in the science lab and were delighted that they used the bunsen burners for evaporation! Year 5 went on a trip to Skipton Castle as part of their history topic on castles. We had a fabulous day learning all about life in a castle! We linked our design technology to our topic on castles and created some wonderful catapults. We experimented with different shapes and structures and then tested them using marshmallows! Y5 enjoyed meeting their Y2 buddies and talking about what it's like to be a junior. Y5 enjoying using ‘Activ Expressions’ in the Maths lesson to solve a variety of number problems, whilst the teacher can keep a close eye on their answers ! Eight members of Y5 represented St Joseph’s at the annual St. Ambrose College Maths Challenge. The competition tests pupils’ maths ability in a number of ways, including problem solving, computer challenges, kinaesthetic puzzles and logic tasks. There were 30 teams this year, so the competition was tough. Team St. Joseph’s were fabulous, taking 2nd and 3rd places. Y5KS attended a science workshop at Sale Grammar. We had a fantastic time learning about gases. 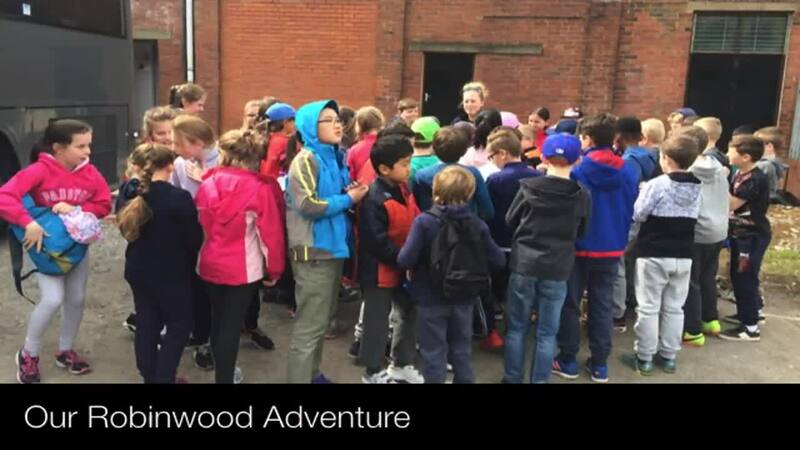 We had a brilliant time at Robinwood, facing challenges and overcoming our fears! We got better at working as part of a team, and we all learned we had skills we didn't know about, such as being super agile climbers, archers, or canoeists! We all managed to solve the riddles in the pirhana pool, and lived to tell the tale. Thank you to all the Robinwood staff for looking after us! We learned some traditional English country dances to celebrate St George's Day. There are definitely some budding Morris men and women here! We had great fun at our Mother’s Day Sale, we raised lots of money and everyone enjoyed choosing a gift for their special person. Malachi's poem hits the back of the net! Zoolab made us squirm and learn!